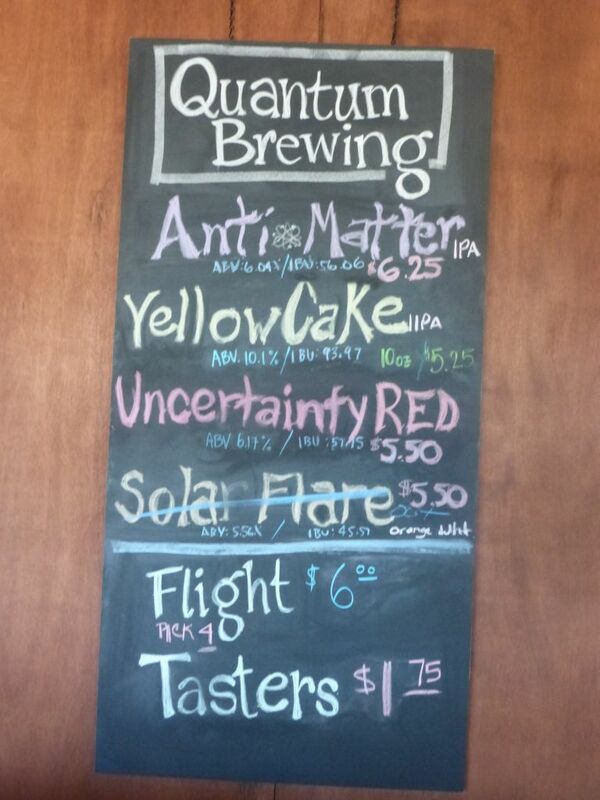 Quantum Brewing Company has been open for a little bit as a test but just recently opened officially. 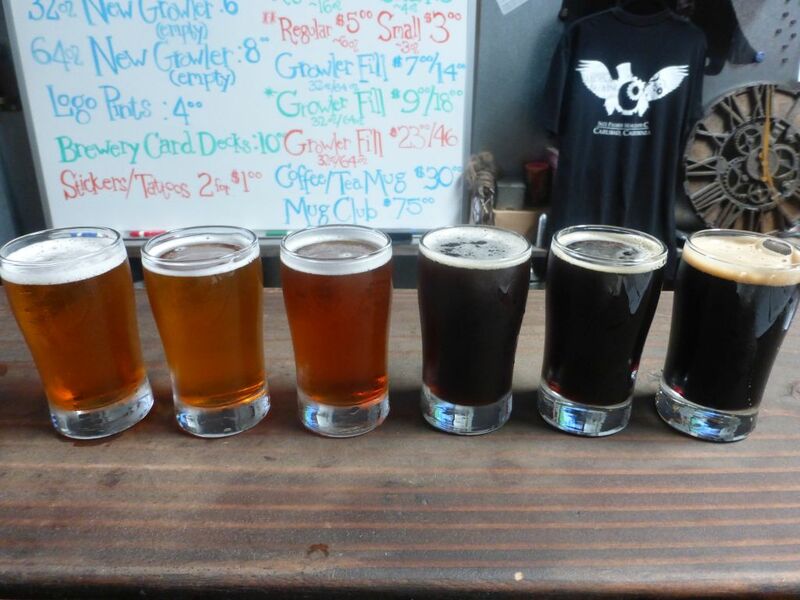 I stopped by on September 19, 2014 for a few tasters to see what it was like. 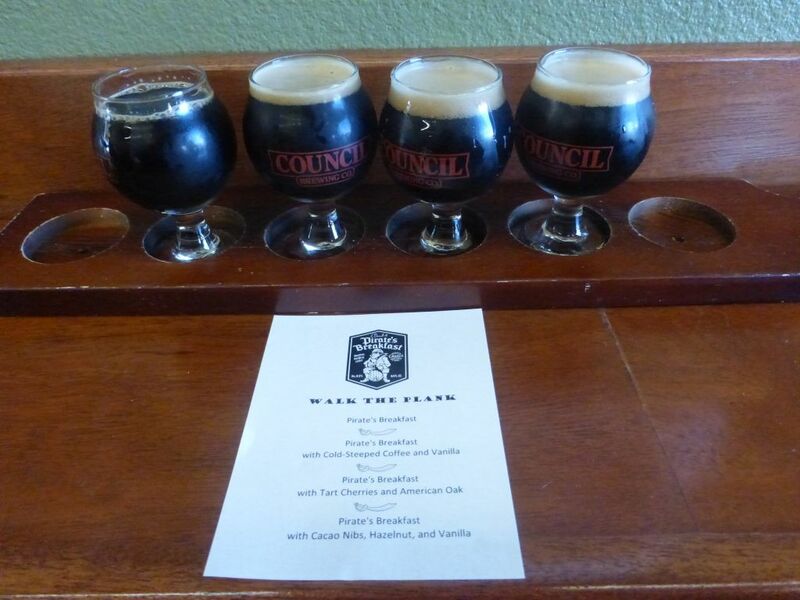 I had already gone to Council Brewing before hand so I had to limit my tasters. I decided to try the Uncertainty red, Antimater IPA, Yellowcake double IPA, and Singularity stout. The uncertainty red was an interesting combination of floral and fruity flavors that I don’t normally taste in a red. These flavors were most likely from added hops, though they didn’t bring any heavy bitterness. The Antimater IPA was a bright tropical fruit beer with a light amount of citrus and medium bitterness. Yellowcake double IPA was again strongly floral and had a solid bitterness that didn’t taste like what the board said. So far the beers were solid but not particularly exciting. Then I tried the stout and I was quite happy. 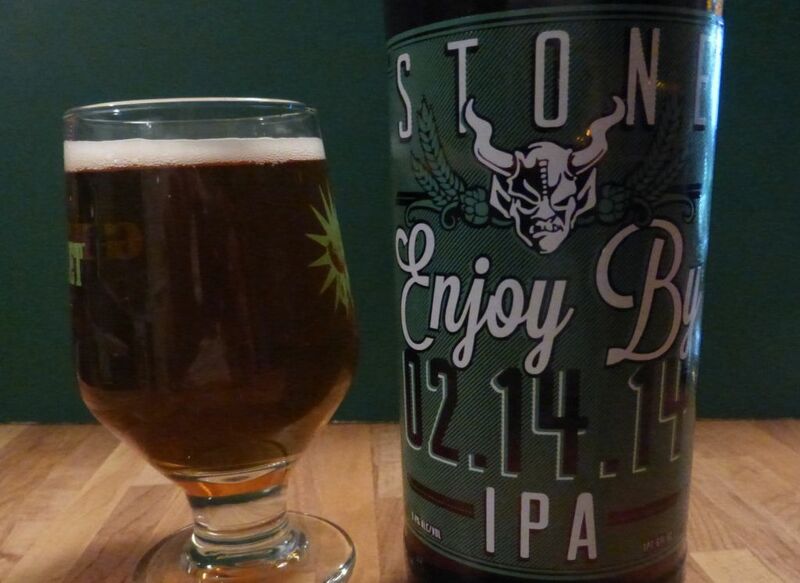 Though it is only 5% and quite mellow it has a good amount of flavor and was served on Nitro. Flavors in the stout were a nice combination of roasted malts and light coffee. I ended up ordering a pint after the tasters and enjoyed it quite a bit. The brewer happened to be wearing a Guinness shirt that day so I expect he was trying to create the proper Irish experience of Guinness which everyone says is better in Ireland. Though I haven’t been to Ireland yet I expect he did a pretty good job here. It hit all the right points. 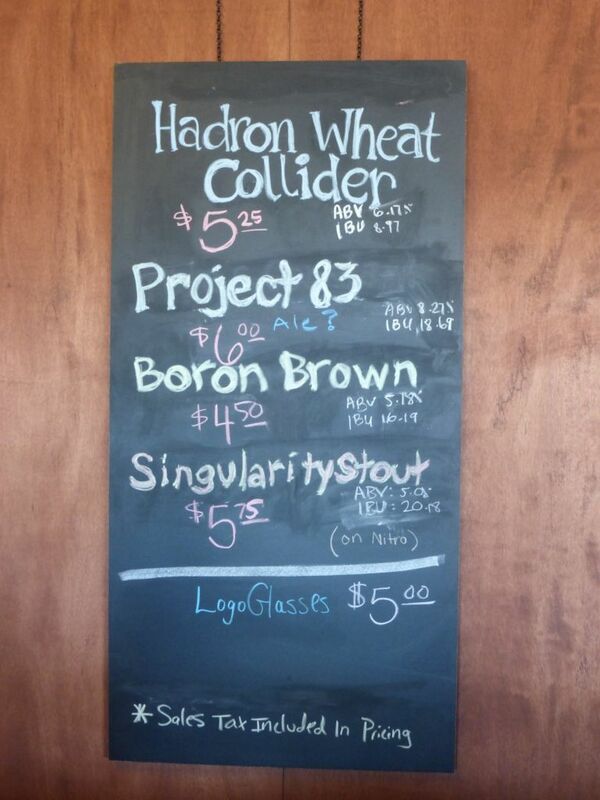 Quantum is still in the early stages and so still exploring new beer styles. Others have been more excited about the IPA than I was because everyone has different preferences for hop flavors. Quantum is off to a good start with a solid stout as their standout and should hopefully start to nail down a few of their core beers soon. Have you been out to Quantum yet? Let me know what you think in the comments. September 19 is international talk like a pirate day. 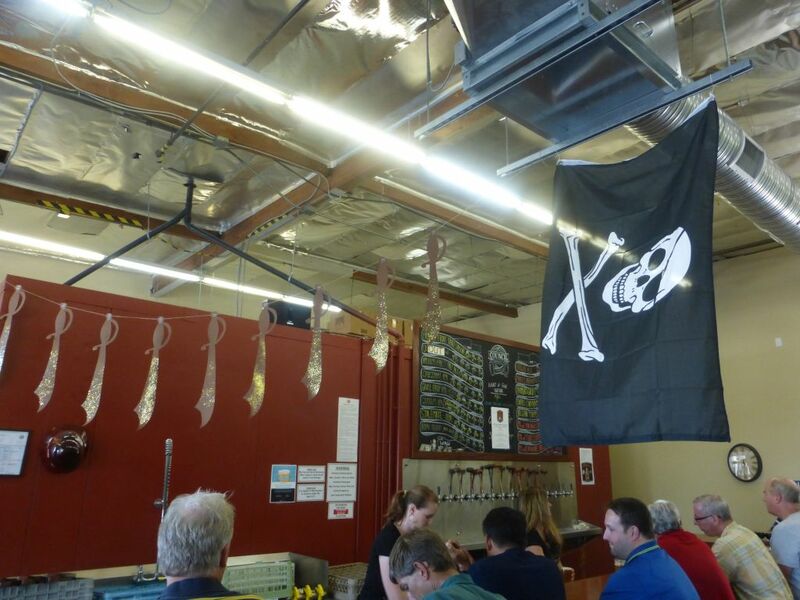 Council Brewing brewed some special versions of their Pirate’s Breakfast imperial oatmeal stout to celebrate. 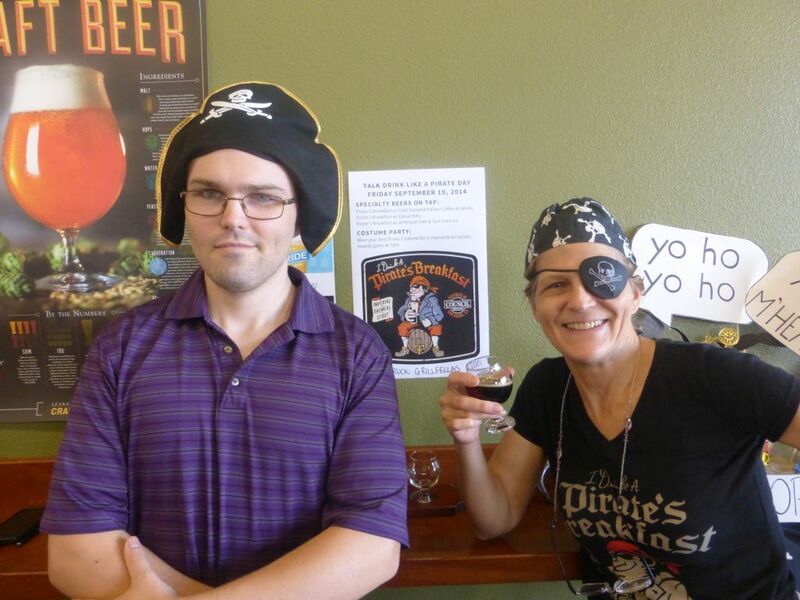 I stopped by in light pirate garb to try the three different stouts. Council served one with coffee and vanilla, one with tart cherries and American oak, and the other with hazelnut, cacao nibs, and vanilla. The coffee version used a Malawi coffee, giving it a really light nutty flavor that balanced well with the vanilla. This was my favorite of the three. The cherry one I was not expecting to like but I found the flavors were very balanced. It was neither too sweet nor too tart with just the right amount of cherry flavor. It reminded me of a cherry pie or some chocolate filled with cherries. Finally, the hazelnut version I couldn’t get into. It smelled and tasted to me like those buttered popcorn jellybeans. Though one of my friends really liked the hazelnut one and drank most of the taster. Me (left) and my mom (right). She really gets into this holiday! Before I left I had a little taste of each of the three IPAs so I could decide which one I wanted to get a pint of. The Gavel Drop batch they had was fantastic, not too sweet and good medium amount of bitterness. The new batch of Chizzam is intensely floral, too much for my tastes. 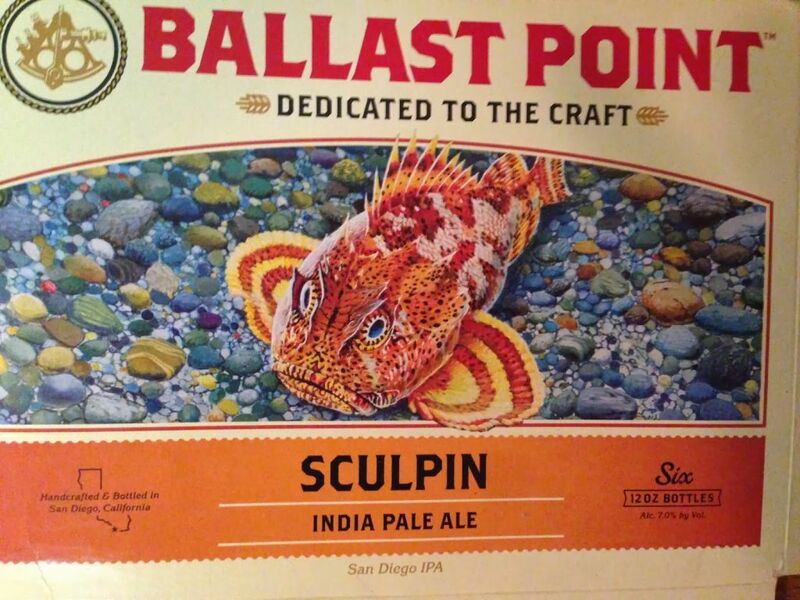 If Societe IPAs tend to give you a mouth full of perfume, this is even more intense. 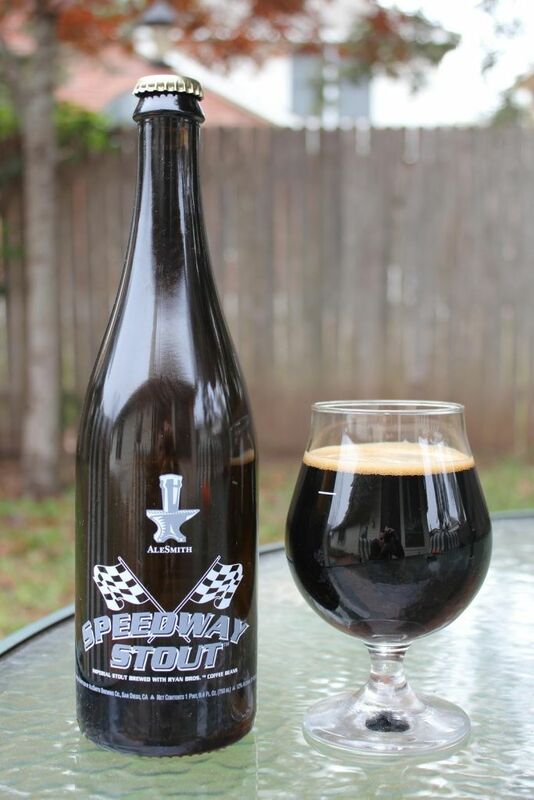 Did you get to drop by and try these stouts? If so, which was your favorite? In my previous post, I mentioned how close together Arcana and On the Tracks are to each other. 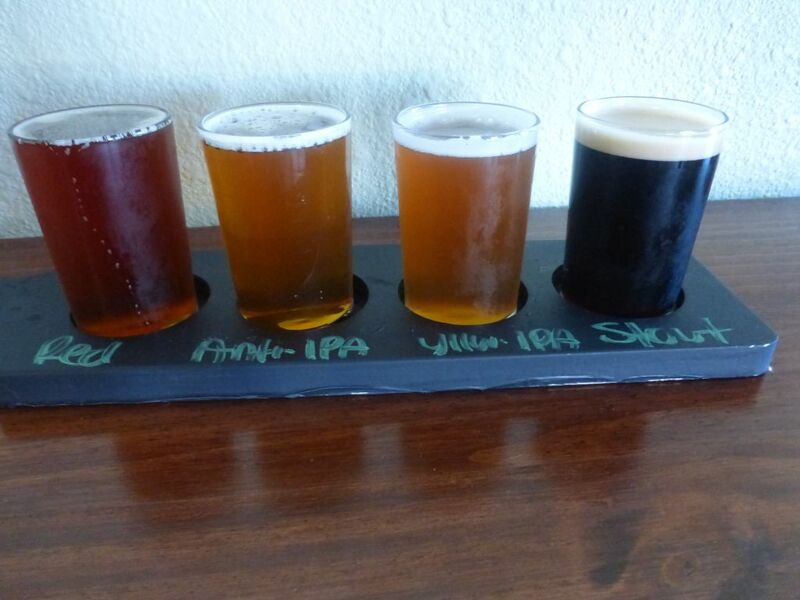 Arcana has a much bigger selection of beers to choose from and a bigger tasting room as well. I was surprised by the beers I enjoyed here because some of them were not what I normally like. Arcana had so many beers on tap that I didn’t get to try them all. It was early when I stopped by and I had things to do later. I ordered a flight of six beers and then was brought some small tastes of two others. 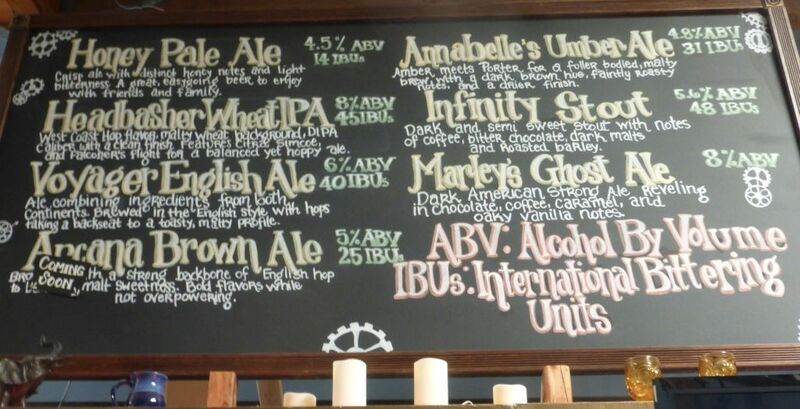 I got to try the Honey Pale, the Headbasher Wheat IPA, the Voyager English ale, the coffee Anabelle, the coffee Marley, the Infinity Milk Stout, a special mix of two beers, and the Mead. Taster flight at Arcana Brewing. The first beer I tasted was the Honey Pale. I don’t normally like honey beers but this one is made with honey malts, not actual honey, so the flavor is not as intense as it is in other beers. It had the perfect amount of sweetness and went down really nice. My husband really liked this one as well. For those curious, honey malts are not simply malts flavored with honey, but a variety of malt that has a sweet flavor that is similar to honey. Part of the tap list when I visited. Specialty beers were on a smaller board. The Headbasher Wheat IPA was also quite nice. 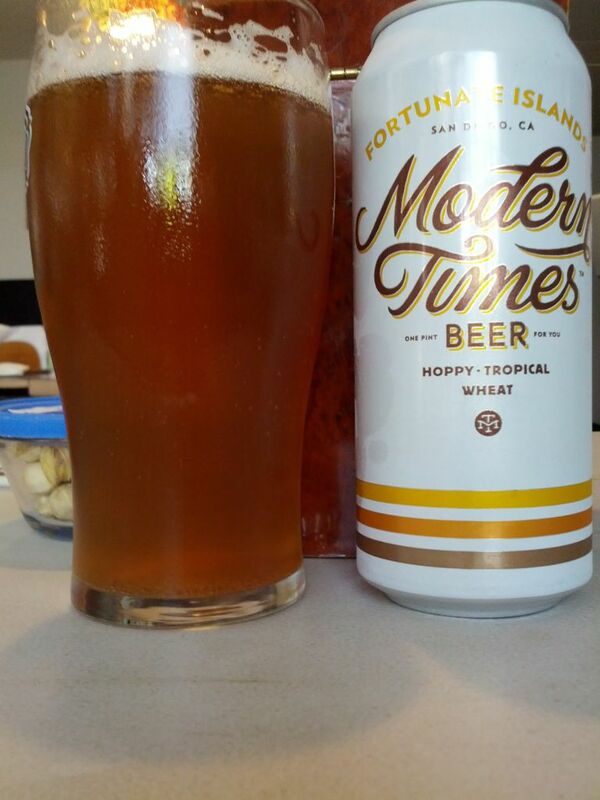 It had a lot of tropical fruit and citrus hop flavors with a good light sweetness from the malts. The Voyager was a bit plain for me. It was mostly a heavy malt flavor with a little bit of bitterness. The coffee Anabelle was a special version of the Anabelle made for Bacon Fest the day before. By the time I got to try it though, the coffee had mostly gone. I would have liked to have tasted it the day before. The coffee Marley was also a bit light on the coffee flavor but it had some really great caramel and vanilla flavors. I wouldn’t have been surprised if this one was barrel aged because it had an oak taste similar to many barrel aged beers. My husband finished most of this taster before I got to try more because he loved it. The Infinity Milk Stout was also quite nice. Flavors were mostly roasted malts with a light sweetness. Before I left, my server brought over a special mix of two beers. She combined the apple ale and a cherry beer, resulting in a nice combination of tart apple and sweet cinnamon. This would be a nice drink to have for dessert. The mead was also quite interesting. It reminded me of a sparkling white wine and would be fun to share a bottle with friends. Considering that Arcana has only been open for a little over a year and a half, I was quite impressed by their lineup. They are working on a rye IPA for the future, which should be a nice balance to the wheat IPA. I could certainly see the honey pale becoming very popular. Have you gotten to try any of the beers from Arcana? Do you disagree with me about some of these beers? Let me know in the comments. In Carlsbad there are two small breweries very close together. 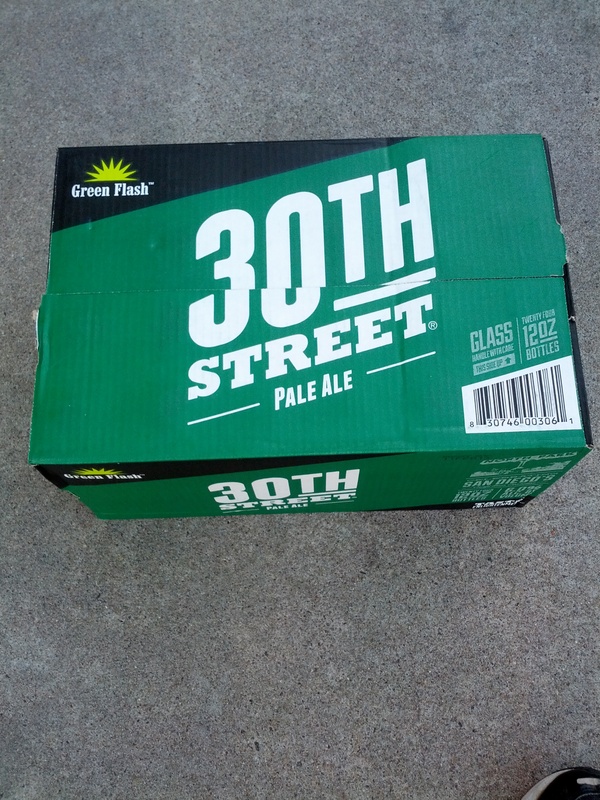 In this post I will write about the beers at On the Tracks. 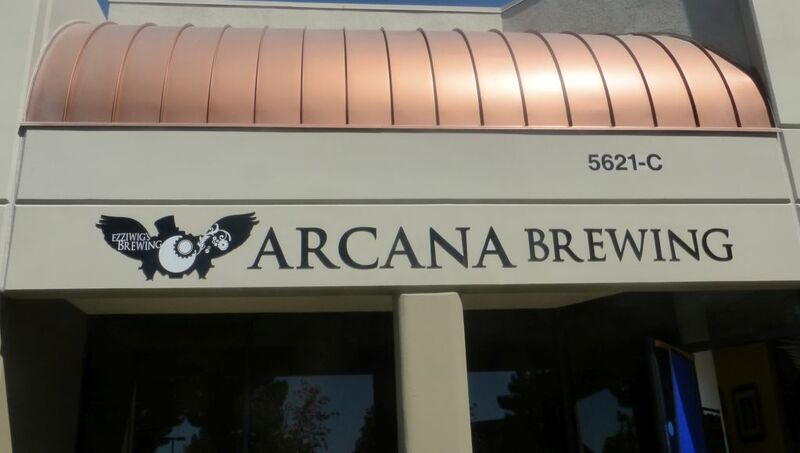 In the next post I will write about Arcana Brewing. The two breweries are so close together that you could park in the middle of the two and walk to both without moving your car. 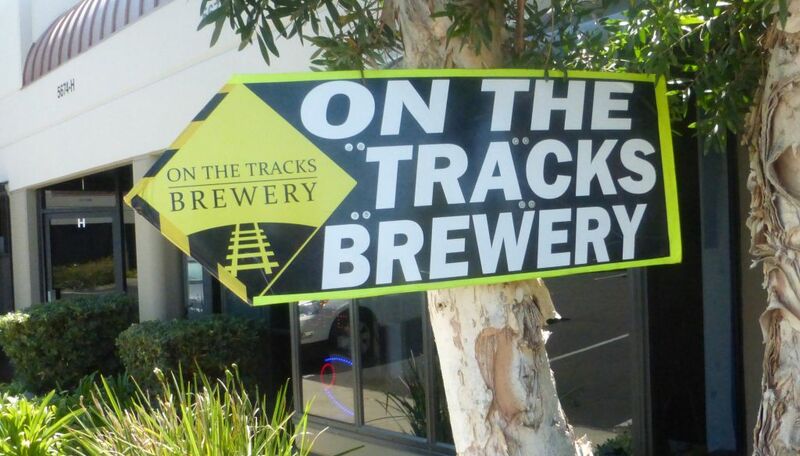 On the Tracks has four regular beers on tap, a ginger beer, an ESB, a double IPA, and a porter made with black pepper. 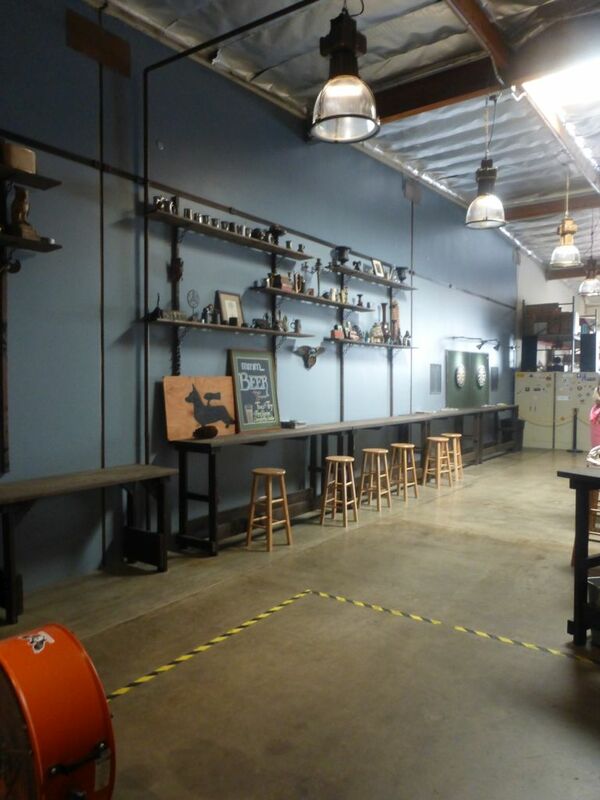 Though they have been open since October of 2011, the tasting room has remained small. Taster flight at On the Rails. The Ginger Beer is an interesting way to do the lighter style of beer that most breweries have. The flavor is light enough that the ginger doesn’t get offensive. I mostly enjoyed the ginger beer as a palate cleanser in between the other beers. The ESB is quite balanced and has a light sweetness and a light bitterness, just as it should be. The double IPA was very surprising because it was well-balanced and also very enjoyable. I tend to not like overly malt-heavy IPAs but this was the perfect balance of tropical fruit and citrus flavors from the hops and a light sweetness from the malts. My husband found this one to be drinkable as well. 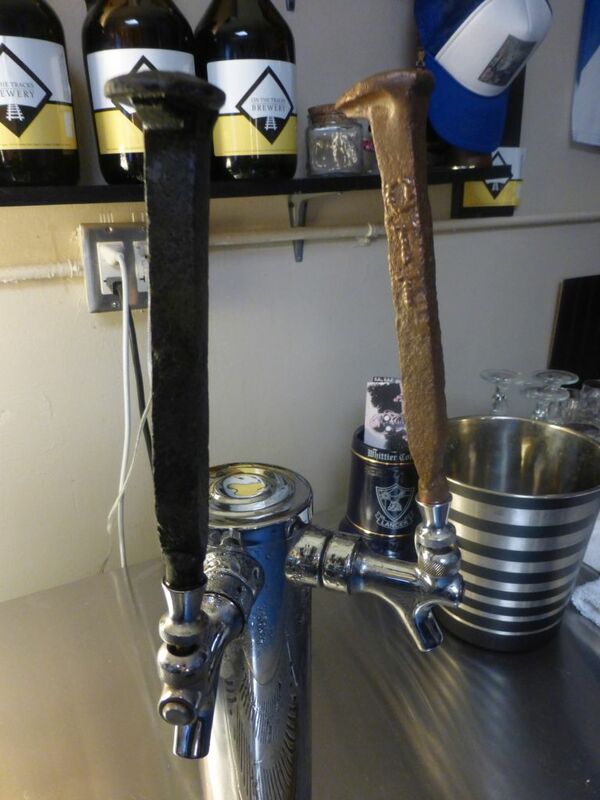 Tap handles at On the Tracks, using those giant iron nails from train tracks. To end things off we tried the black pepper porter. This is certainly to be a polarizing beer as the owner indicated. 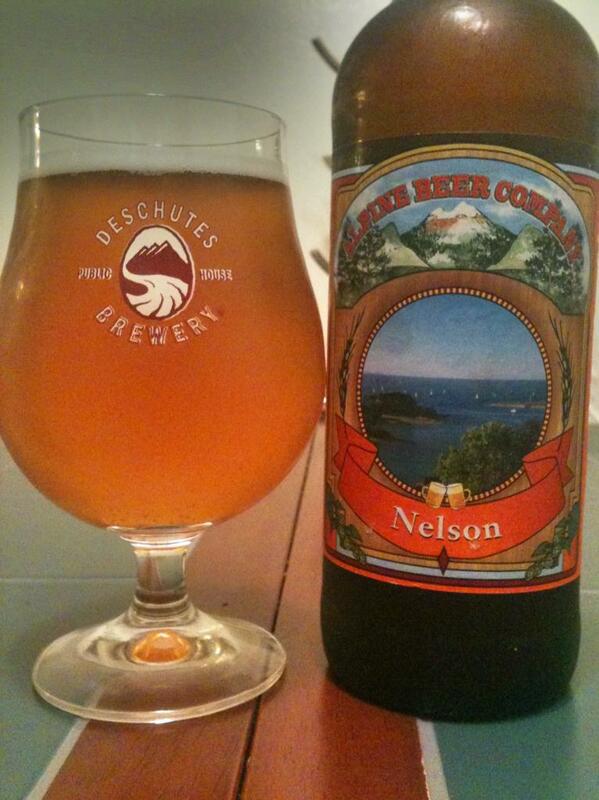 There is a serious back-of-throat burn that you get as soon as you take a sip, reminiscent of habanero beers. The owner said that we should get some chocolate and roasted malt flavors once we get past the pepper but my husband and I both had a hard time getting past the pepper. On the Tracks has some solid beers and would be worth stopping in once if you are in the area. Plus, you can easily hit Arcana in the same trip, where you will also find some different beers. Have you gotten out to On the Rails? Do you like their beers? Let me know in the comments.